“Many hands make light work”—the pioneer tradition of barnraising, a community event in which neighbors work together to erect a barn for a local family, exemplifies the saying. That same spirit of community service infuses the South American minga and Mexican tequio. 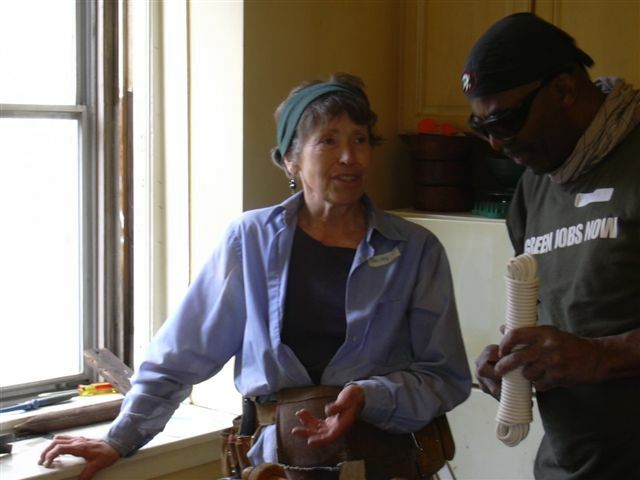 This Saturday, January 12, 2013, from 11am to 5pm, BostonCAN and local volunteers will put a green twist on the barnraising and minga traditions as we work together to weatherize the home of Jamaica Plain resident Yolanda Gonzalez. Barnraising volunteers Becky and Tim discuss how to tighten up old wood windows. This will be the third weatherization event BostonCAN has hosted in Jamaica Plain, but the first that is bilingual. Four native Spanish speakers will be among the seven experienced team leaders teaching volunteers the skills required to seal drafts at Gonzalez’s Minden Street triple-decker. The Green Minga will also call attention to the benefits and limitations of the state’s MassSave program. Because of the various income levels of the occupants in the three-family house, Gonzalez has not yet been able to fully insulate the house through the City’s weatherization program, Renew Boston. Although Renew Boston has initiated effective innovations within MassSave, income qualifications still stymie some households within the City and beyond. While policy makers struggle to resolve these barriers to wider participation in MassSave, the Green Minga will help make Gonzalez’s house much less drafty and more energy-efficient. Volunteers will leave with more than just the satisfaction of having helped a neighbor. They will learn simple techniques for saving energy and money, which they can apply in their own homes. At a mini career fair at the end of the day, job seekers will have the opportunity to meet trainers and employers in the weatherization industry. The event will also feature food and activities and supervision for children. If you would like to participate, please call Loie at 857-544-6846 (English) or Catalina at 857-244-9104 (Spanish or English), or send an email to minga.bcan<at>gmail.com. You can also sign up online or through Facebook. Together, we are building a new tradition—working together to make our communities friendlier, greener places to live! This is great news! I’d be interested in talking with someone from your organization if you are available – I’d like to hear more about the work you are doing.